As you will know from these pages, ‘Ireland of the Saints’ is a country rich in treasures dating from medieval times. Architecture and stone carved ecclesiastical monuments were prolific on the island of Ireland, with many examples and fragments remaining. Finola has a series covering Romanesque Architecture, while I have always been on the lookout for High Crosses from the early medieval period. 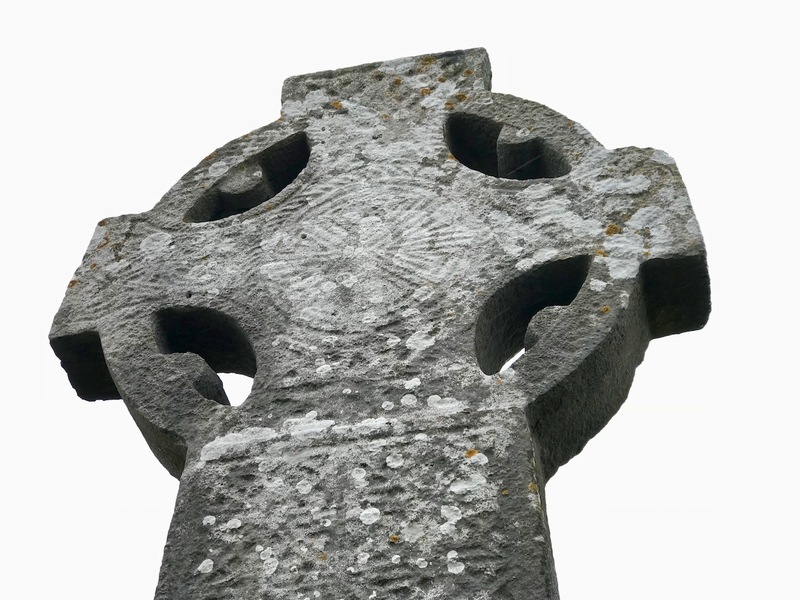 Over 250 examples of High Crosses are said to survive in Ireland, either complete or broken – a remarkable number. Without fail, all are beautiful, and wonderful examples of early art and craftsmanship. 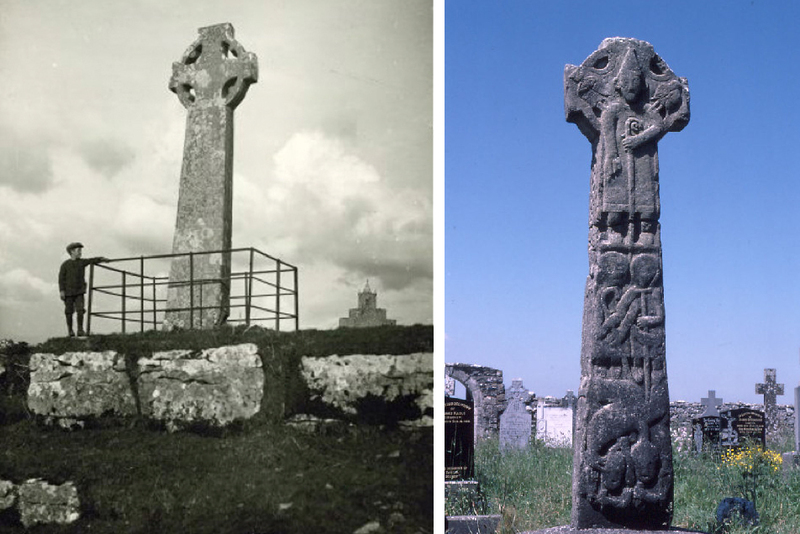 When we are out and about, we usually don’t have to go very far off whichever route we are travelling to find more examples to add to our archive of The Irish High Cross. 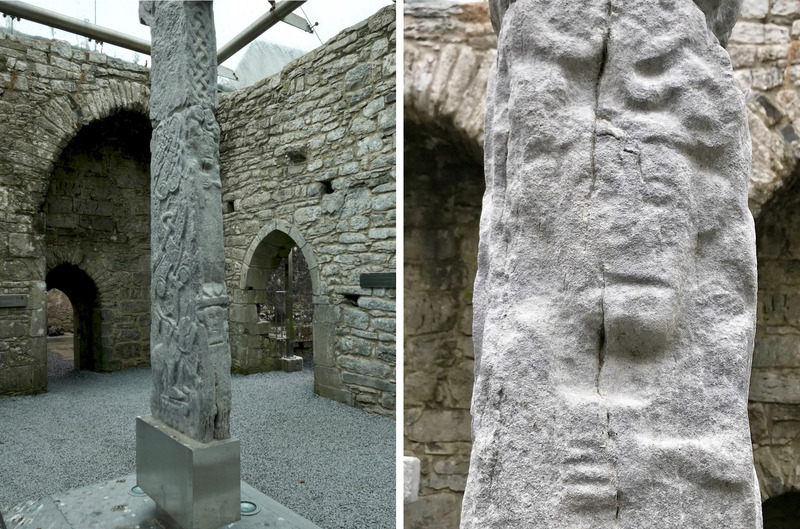 Last week was no exception: we were off to the Burren in County Clare to see a new exhibition of the work of our friend Keith Payne, and it was no trouble to take a little detour in County Clare to view ‘Ye Citie of the Seven Crosses’ – Kilfenora. A wonderful carved capital on the Cathedral there is shown above (the drawing of it on the right is from Duchas). I knew the place because of its famous Ceilidh Band, but I am now aware that even this admirable institution must take second place to the Kilfenora High Crosses. 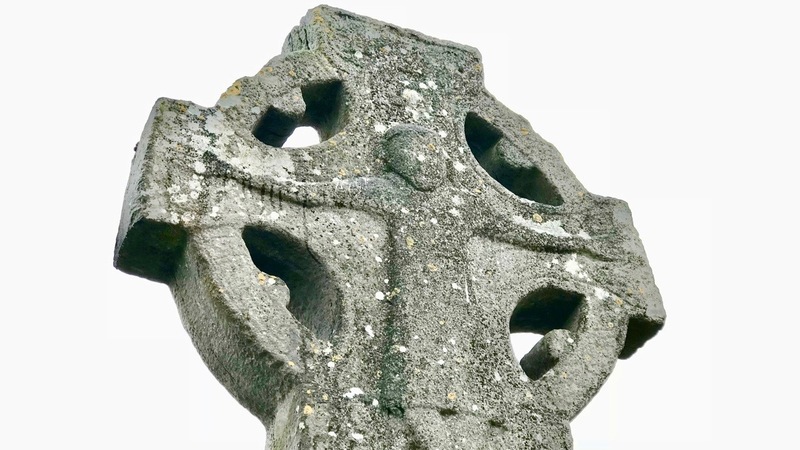 The most detailed description of the Kilfenora crosses was written by historian Jack Flanagan (1921 – 2014) and it’s available online, courtesy of Clare County Library. Jack lived most of his life around Kilfenora, and charts the fortunes of the High Crosses through the 20th century, mostly from his personal experience. Now they are well looked after – some are under a glass roof – but they have suffered various misfortunes throughout the last Millennium. Above are all that’s left of two of the crosses – both now protected. 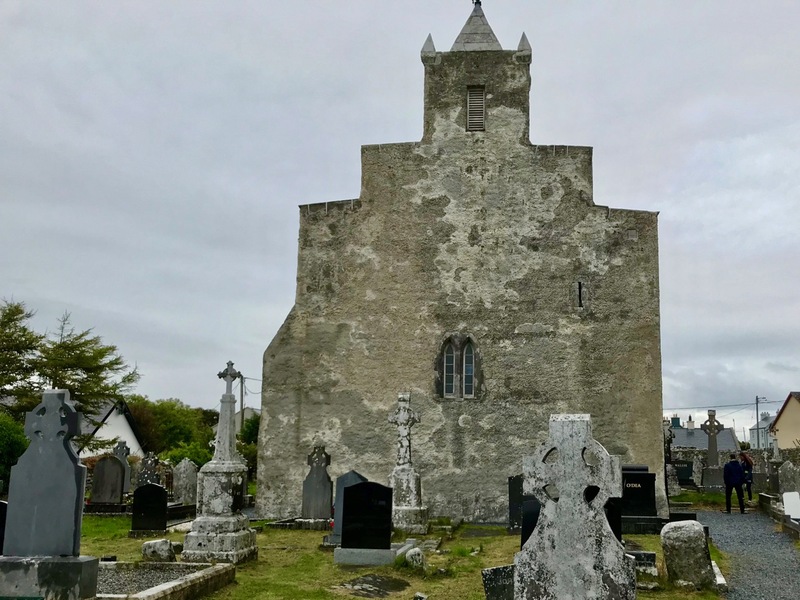 You would hardly think of Kilfenora as a ‘city’ – but the hamlet of thatched dwellings was an important monastic centre from the days of Saint Fachtnan (from County Cork) who founded it around 650AD. It has its Cathedral (above), although . . . it was the smallest with the poorest diocese in Ireland . . . (Flanagan). However in 1111 the Synod of Rathbreasail snubbed the claims for diocesan status by Kilfenora, and the O’Connors and the O’Loughlens came together in their desire to remain aloof from the Diocese of Killaloe which was very much under the patronage of the O’Briens. There was history here, as it was the O’Briens who had burned Kilfenora Abbey and its inhabitants in 1055. At the Synod of Kells in 1152 Kilfenora did succeed in its claims, and attained status as a separate diocese. It’s said that some of the High Crosses were carved and erected to celebrate this achievement. 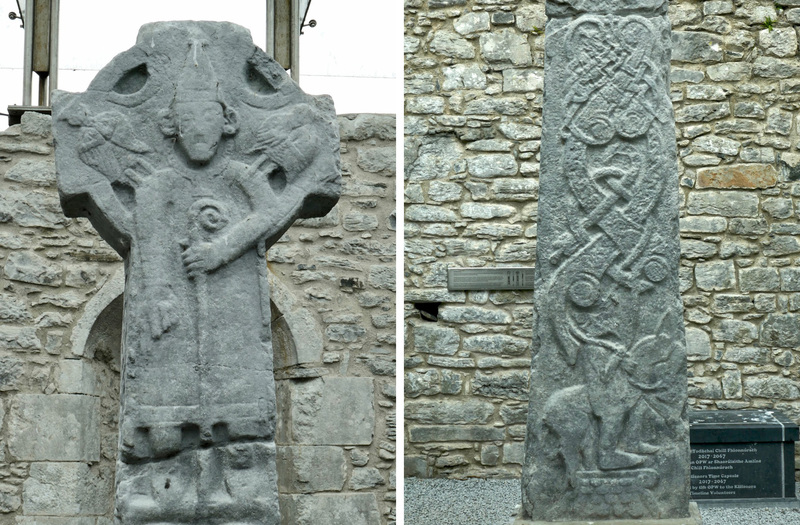 If this is the case, then the Kilfenora High Crosses are relatively late examples of the art. This would seem to be borne out by the style of the finest of them – now known as the Doorty Cross – because the interlacing designs on the shaft are undoubtedly influenced by Scandinavian motifs. This, then, must have been a time when the Viking invaders were not only accepted but also assimilated into the artistic culture: this would have been the case by the mid twelfth century. 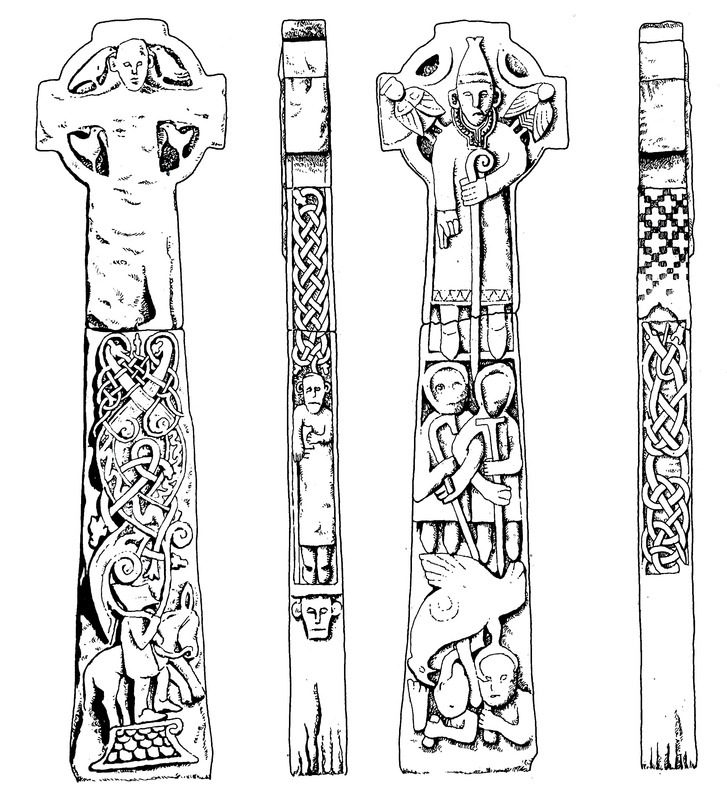 The Doorty Cross (upper, details from west and east faces and lower, Duchas drawing) has a partially traceable history. Jack Flanagan remembers when the main part of the shaft was in use as a grave slab of the Doorty family in the burial ground of the Cathedral, while the head was lying under the chancel arch in the sacristy. In the 1950s the two parts of the cross were reunited by the Office of Public Works, and the restored cross was erected next to the Doorty grave – hence this cross is now known as the Doorty Cross. 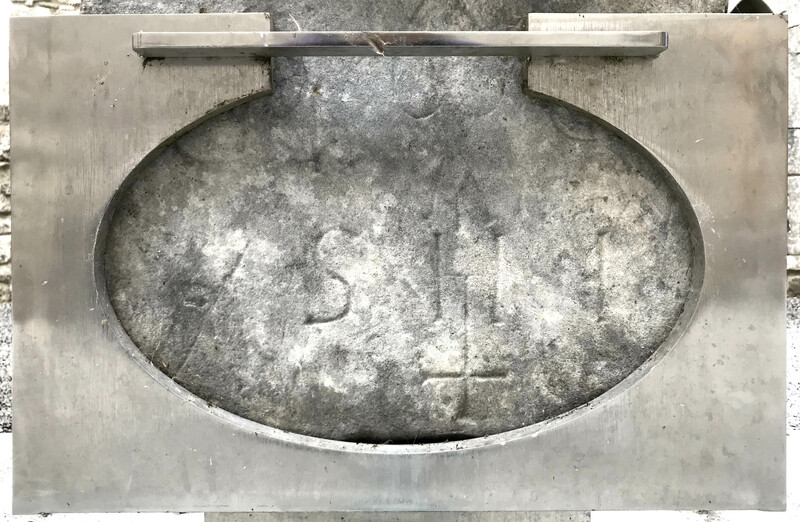 Interestingly, there is an inscription on the base of the cross shaft which dates from 1752: this was buried when the cross was re-erected, but is now visible as the cross was removed into the new glass roofed shelter in the mid 2000s. 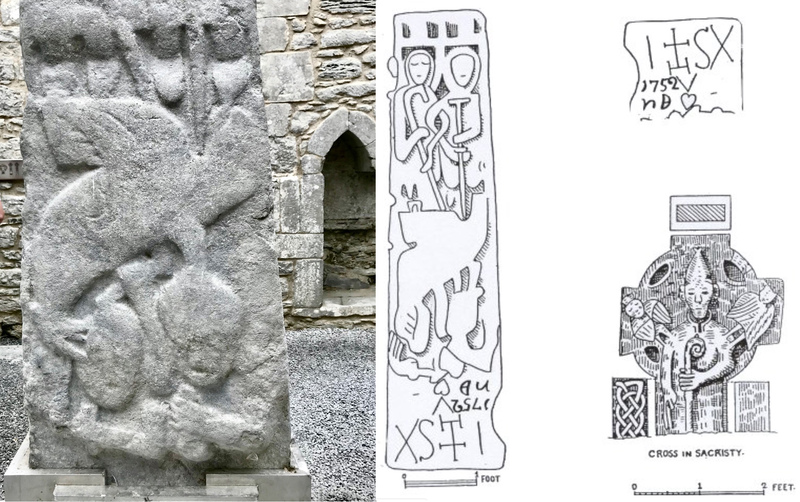 The upper picture below shows the inscription visible today – it’s upside down on the raised cross: the lower picture shows a drawing made by Westropp in 1910 when the shaft was still used over the grave: the inscription can be read as IHS X V n D – the V n D stood for V ni Doorty.
. . . On a visit to Kilfenora in 1820 where there had been five or six stone crosses I found two or three broken and laying on the ground, neglected and over-grown with weeds. On expressing my concern that these remnants of ecclesiastical antiquity were left in such a state, a clergyman of the parish proposed to send me one of them, which he said might be done without difficulty or danger of giving offence, as when they were brought to that state the people had no regard for them. 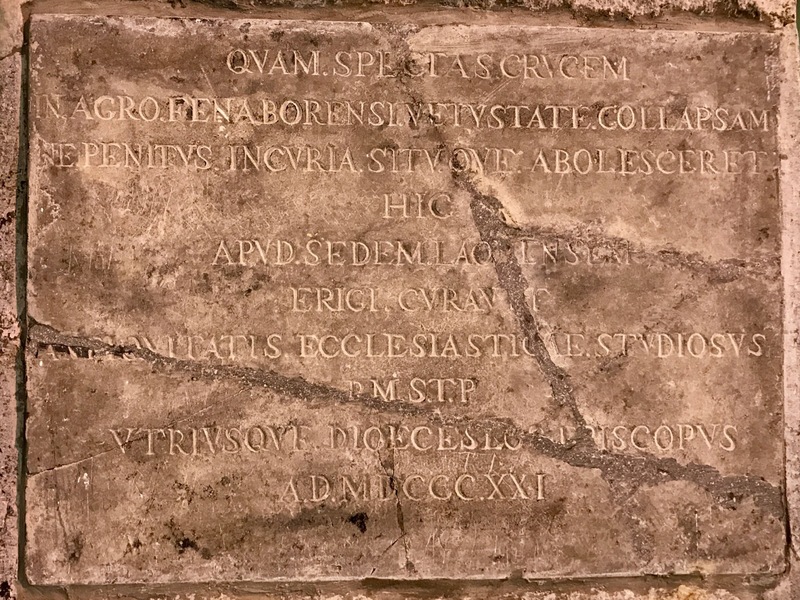 One was accordingly sent to Clarisford, and I caused it to be erected among some trees in a picturesque spot, between the house and the canal, having inlaid the shaft with a marble tablet bearing the inscription annexed below. When my daughter was at Clarisford about three years ago, the cross was still standing, being considered “an ornament to the grounds” . . .
. . . R.M.S.T.P. (Bishop’s name and title) of both diocese, being solicitous for church antiquity, took care to erect at the See of Killaloe this cross which you see, and which collapsed at Kilfenora lest it entirely disappear through neglect, and by reason of the site A.D. 1821 . . . It seems there was still little love lost between the two diocese. 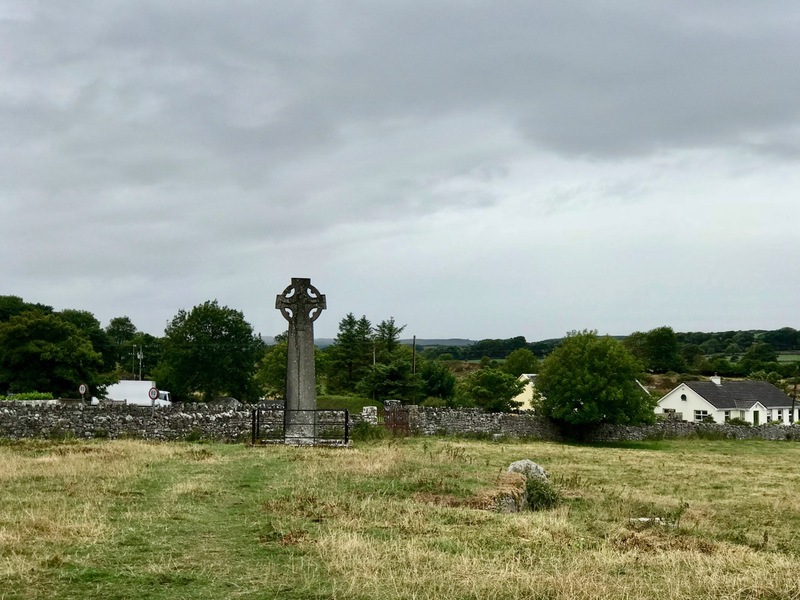 The Kilfenora Cross on the Hill has now been moved into the St Flannan’s Cathedral at Killaloe – and that’s where we saw it back in September last year. 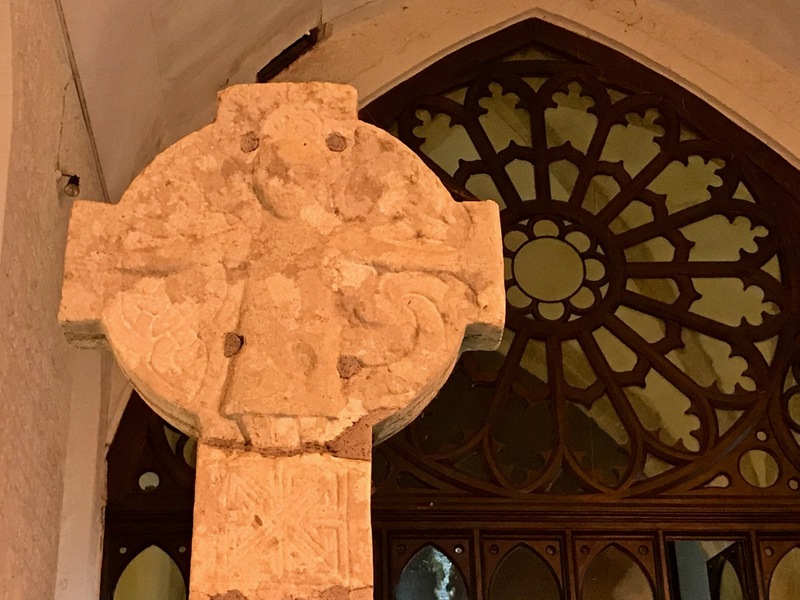 When you speak to local people in Kilfenora you get a sense that there are grumblings – they feel they would like their cross back: it would be one of the finest in the collection. Left – the West Cross (see header picture and below) in 1910, possibly taken by Westropp: it’s still in situ to the west of the Cathedral today – the cathedral building is on the right of this photo. Right – the Doorty Cross standing beside the Doorty grave in 1980. 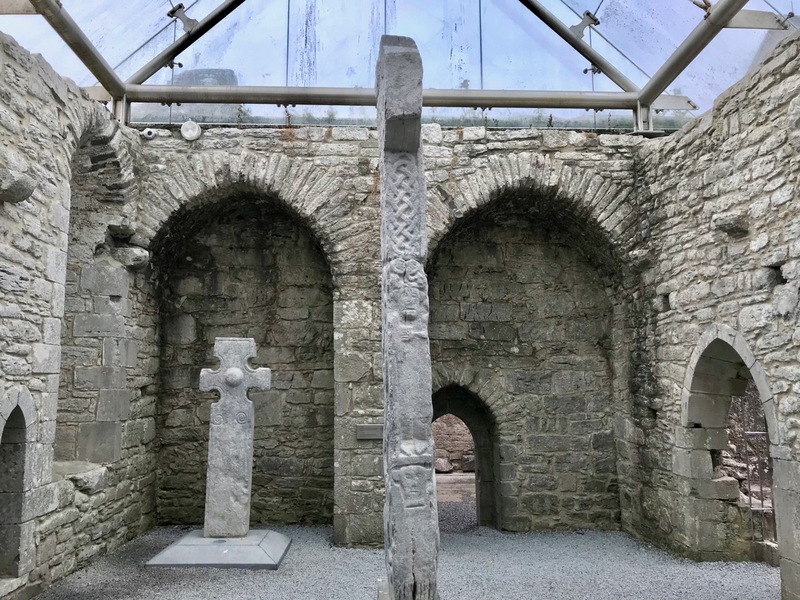 The West Cross at Kilfenora has escaped capture under the glass roof and still stands – probably where it always has – on a prominent knoll to the west of the Cathedral. It’s open to the elements, but seems to be in good condition. 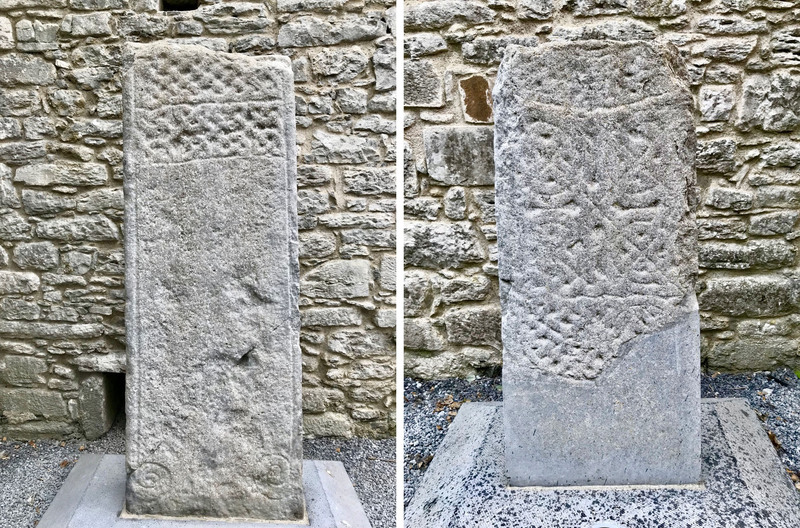 In some ways, the protection of these ancient pieces does in some way detract from their magnificence, but there’s no doubt that constant exposure to the weather extremes that we experience here in Ireland must ultimately adversely affect them. It’s a conundrum – and a debate we have touched on before. Perhaps my own response to these protected High Crosses in Kilfenora is that I feel they are under-appreciated. I saw – at the height of the tourist season – coach-loads of visitors disembark, enter the sheltered enclosure, stand and look at the old stones for a few minutes and then file out. What did it all mean to them? There are interpretation boards but I doubt they get the message across: these are great monuments of the world, to be revered, respected and wondered at: these representations take you back through a thousand years of history: we are fortunate that we can still be in their presence.